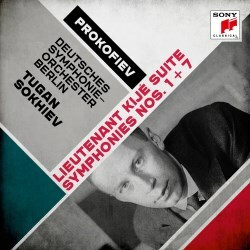 The Russian conductor Tugan Sokhiev has been winning golden opinions for his Prokofiev recordings. Michael Cookson thought his Symphony No. 5 coupled with the Scythian Suite “two of the most riveting orchestral performances I’ve heard for some time” (review) and was similarly complimentary about his Ivan the Terrible (review). Here is another instalment in what looks as if it going to be a complete Prokofiev symphony cycle, that is if Sokhiev can find time to complete it: he gave up his role with the Deutsches Symphonie-Orchester Berlin in 2016 as he is now music director and principal conductor of the Bolshoi Theatre. Prokofiev’s first and last symphonies make a good pairing: they each have an assumed simplicity which might deceive the unwary. The first is the Classical Symphony, a symphony the composer suggested was such as Haydn might have composed at the time, though with something new in it. The title Classical is his own. The most Haydnesque feature of it is the sudden changes of key. Otherwise the work is thoroughly characteristic of the composer, with witty themes and piquant scoring. It is also very short – much shorter than a real classical symphony. He reused the third movement in the Romeo and Juliet ballet some twenty years later showing that his style was already fully formed. Sokhiev’s view of this work is very slightly more serious than usual: the speeds are slower, except in the finale, and the playing, while obviously perfectly competent, seems less sparkling than I expect to hear in this work. I struggled to find what it was that was troubling me. For some reason the sound seemed a little tubby. It might have been something to do with recording in the Philharmonie in Berlin, which favoured the strings unduly compared to the winds, or it might have been that a German orchestra whom I last heard in Bruckner did not find Prokofiev’s idiom came naturally to them. Of course German orchestras can play Prokofiev perfectly well – consider Michail Jurowski’s recordings with various German orchestras. Eventually I turned up the treble control slightly and was then happier. I went to the Orpheus Chamber Orchestra for comparison (review) and immediately felt that this was how this work should go. The seventh symphony started life as a work for young musicians though Prokofiev soon left that idea behind. He started work on it in 1951, three years after the notorious Zhdanov declaration which condemned Prokofiev, along with Shostakovich, Miaskovsky and Khachaturian, for the crime of formalism. Many of his works were banned and he withdrew from public musical life. He hoped that this symphony, an easier work than the grim and sombre sixth, would find favour with the authorities. In fact it won a Stalin prize, money which he badly needed. It carries the same opus number as Beethoven’s C sharp minor quartet and is in the same key, and I wonder whether Prokofiev saw it as a kind of summing up of his work. It is in four movements, strongly contrasted, but with an undertone of melancholy which runs through all of them except the waltz second movement, which he adapted from his ballet The Stone Flower. It was some time since I had heard it and this time I was reminded of Bax’s last symphony, also his seventh, and also valedictory. The first movement is in sonata form with three strongly contrasted themes, of which the third features an oboe with a glockenspiel. The second is the waltz. The third is a set of variations on a simple theme and the fourth is lively, though near the end Prokofiev brings forward the second theme from the first movement dressed in great grandeur. He originally wrote a quiet ending but was persuaded to added a louder one, which adds half a minute to the timing. He did this only to improve his prospects of winning the prize and said it should not be used again. Nevertheless, Sokhiev plays it. I wonder why. I found his performance of this work more satisfying than that of the Classical symphony, though the orchestra still seemed more at home with the big themes on the strings than with piquant writing for the wind. Still, it is an elusive work and Sokhiev got much of its character. I wish, however, that he had stuck with the quiet ending. As a filler, though in fact it comes first on the disc, we have the suite from Lieutenant Kijé. This was a film about a soldier in the army of Tsar Paul I (1796-1801), who had every military virtue except one – he did not actually exist, being the result of a clerical error. Prokofiev’s suite takes us in five tuneful movements through his life from his birth to his funeral. I actually enjoyed this most of all the works on this disc. This time the balance between wind and strings seemed right and I note that it was the work most recently recorded. The orchestra revels in Prokofiev’s jolly tunes and the saxophone has an especially good time. There are many other recordings of all the works here, particularly of the Classical symphony and Lieutenant Kijé. The only direct comparison for this programme is with Previn, whom I have not heard but who is always reliable in Prokofiev (CDC7 47855, now only available as a download). For the symphonies I dug out a coupling of these two which almost comes into the historic category: Nicolai Malko in very early stereo (review). This of course is analogue, but very good analogue and the performances show a firmer grasp of the idiom than Sokhiev; the coupling is the Love of Three Oranges Suite. There are many complete Prokofiev symphony cycles now, some of them quite old, so you may prefer these recent performances, which, despite my reservations, are workmanlike.